Dubbed as the ‘Queen of Ivory,’ the Chinese businesswoman allegedly employed poachers in Tanzania for 14 years. 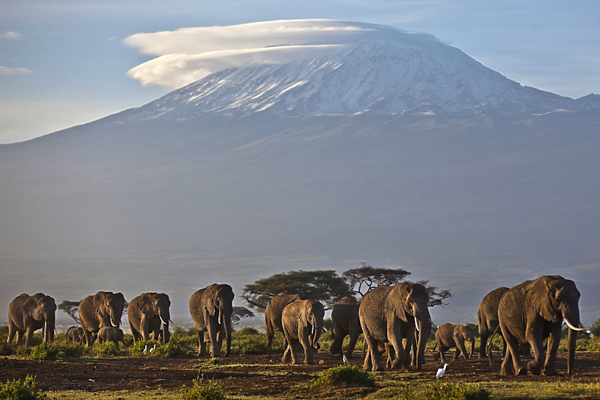 Adult and baby elephants walk in the dawn light, as the highest mountain in Africa, Mount Kilimanjaro, is seen in the background. A Chinese woman has been charged in a Tanzanian court with smuggling nearly 1.9 tons of ivory. A Chinese woman accused of leading one of Africa’s biggest ivory-smuggling rings has been arrested and charged. Yang Feng Glan was arrested early this week by a specialized task force in Tanzania that had closely monitored Ms. Glan for a year as she traveled between Beijing, Uganda, and Tanzania carrying out the illegal ivory trade, Tanzania’s daily news website The Citizen reports. Ms. Yang, who is said to have been an important link between East African poachers and Chinese buyers, was charged on Wednesday alongside two Tanzanian accomplices. “Most important trafficker ever busted,” the US-based Elephant Action League tweeted. Tanzania is known as the epicenter of elephant poaching in Africa; the government recently estimated that 65,721 elephants have died in the country in the last five years. The number of Tanzanian elephants plummeted to 43,330 in 2014 from 110,000 in 2009. In 1961, at the time of Tanzania’s independence, the elephant population stood at 350,000. In the whole of Africa, the elephant population was estimated at 1.3 million in 1979, but the number is now closer to 450,000, according to the World Wildlife Foundation. Investigators allege Yang smuggled and traded 706 elephant tusks weighing nearly 1.9 tons worth $2.5 million between 2000 and May 2014.